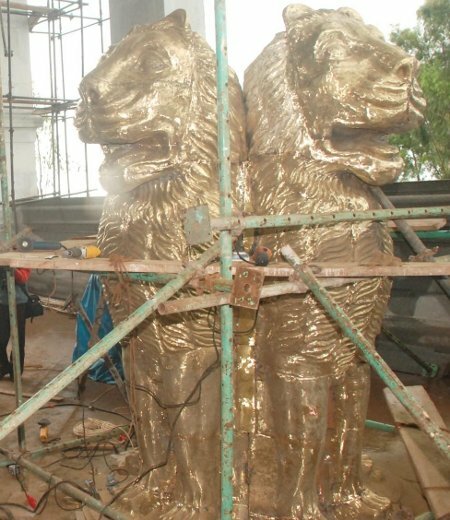 Ashok Pillar (stambh), the National Emblem which is a replica of the Lion of Sarnath, near Varanasi in Uttar Pradesh State, would be fixed atop the main dome of Suvarna Soudha in Belgaum. The same has been made by the V T N Creative Art Studio Gulburga under the supervision of sculptor T N Vishweshwaraiah. Ashok Pillar measures 3.68 metres in length, 2.11 metres in breadth and weighs 6.50 tonnes. The emblem weighing 6.5 tonnes is made of three metals —60 per cent brass, 30 per cent copper and 10 per cent nickel at a cost Rs 70.56 lakhs. The pillar would be installed in a few days atop the main dome at Halga with the help of hi-tech cranes.